Best Pro Scooter Wheels, The Ones You Should Know About! 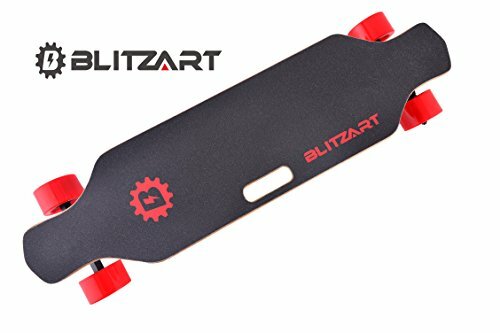 What are the best pro scooter wheels? Are you looking for a new set of scooter wheels yet you don’t know what to buy? With the rise of many scooter wheels, many companies have actually continued to create their own design and features of scooter wheels. However, not all of these wheels can perfectly fit your taste and need. To better help you choose the best, take a look at the list of the Best Pro Scooter Wheels below for you to decide. TFox signature wheels by Lucky come in three different colors ways and two different size options. Featuring a hollow core design and eye popping colors these wheels are head turners. TFox is responsive and is one of the most anticipated wheels in the industry. This wheel has a high-performance which help you to get ready and feel the ride. Another good thing about this wheel is it is being sold individually and not as a pair. So, you can easily personalize your wheels. This TFox features a Lucky Rebound Technology which is a combination of new pouring process and a high-performance urethane. This wheel also delivers a fast, grippy and buttery roll. Lucky TFox continues to innovate the processes to get the best wheels and better focused on the performance, the durability of the wheels and the feel. These wheels are only limited so get yours now while it’s still available. The weight of each wheel is 0.22 kg. This Lucky TFox scooter wheel also includes bearings which are already installed. You will surely love the size and the color of this wheel. If you are looking for the best scooter wheel, this TFox could be your perfection option. Phoenix Kai Saunders has been on the team of Phoenix for two years now. With his loyalty, the team believed that it was time for him to put his name on something as he climbed the ladder from simple into a professional. When it comes to the material, this wheel is high quality, a colored Polyurethane wheels which promote durability and longevity of the wheel. 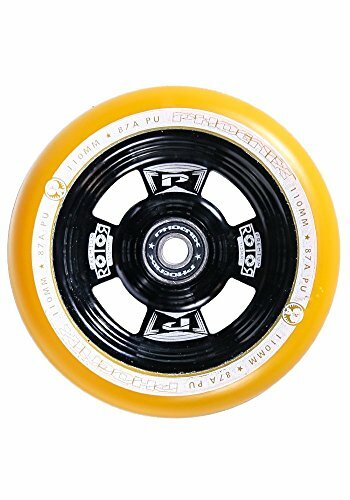 This wheel is compatible with almost all scooter which wheels are 110mm and its size is 110mm x 28mm in wide with 9 bearings installed. It can be bought individually so you can personalize your scooter. This wheel weighs 0.52 lbs. With the durability of the wheel, it can last for a long period of time. Therefore, this is worth for an investment for your scooter. 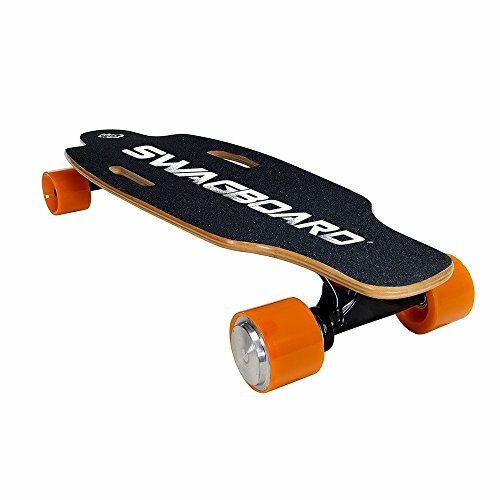 If you are looking for a new wheel with the best price offering, check out this scooter wheel. 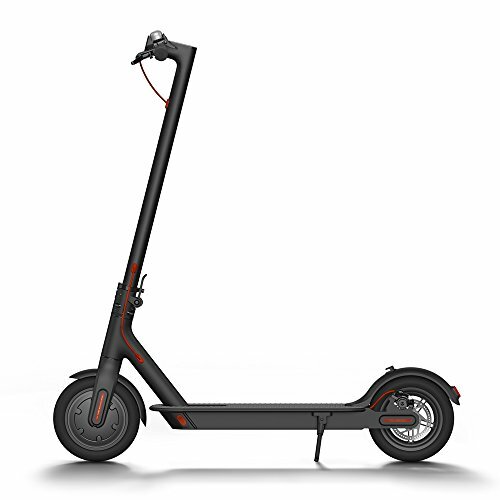 As a product of Phoenix Pro Scooters Company, Phoenix quickly set the world of the scooter into a different way. 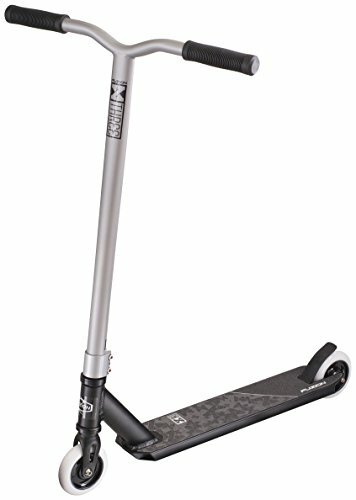 This F7 Alloy Pro Scooter will take your scooter experience to the next level. The wheel assures that you will have a smooth ride. You can completely enjoy riding your scooter with this new wheel. You can buy this Phoenix F7 Alloy in single or in the set. 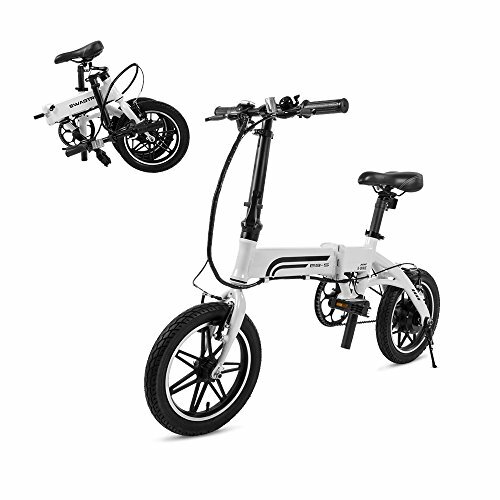 It is made up of high-quality and durable materials and is compatible with any 110mm wheel scooter. Since this wheel is metal, they are much durable as compared to plastic core ones. Metal cores are stronger than plastic. Therefore, it is better to choose metal core especially if you are an advanced rider. They hold up better than the plastic and its neo-chrome color is quite attractive and provides you a smooth ride. If you are looking for the best wheel with good quality, this wheel is worth considering. Do you want to customize the wheels of your scooter? 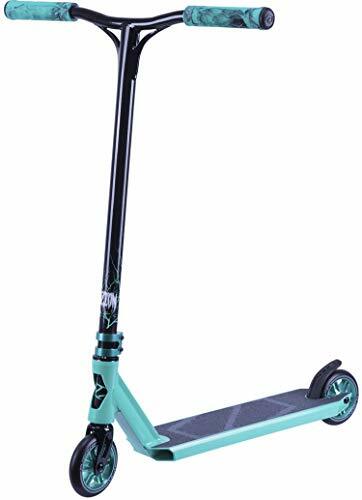 This Liberty Pro Scooters will give you the chance to customize your scooter. With its durability which made up of 88a rated Poly Urathane and the high-quality design, this wheel is one of the best scooter wheels. This wheels can help you to fly to new heights and completely level up your scooter experience. Liberty Pro Scooters features the hollow technology which produces some of the best and lightest scooter wheels. The size; 110mm. if you are in search of the best scooter wheels on the market, this Liberty Scooter Wheels could be one of your perfect choices. This will take your riding experience to the next level. These scooter wheels are being praised by many avid riders because of its features. 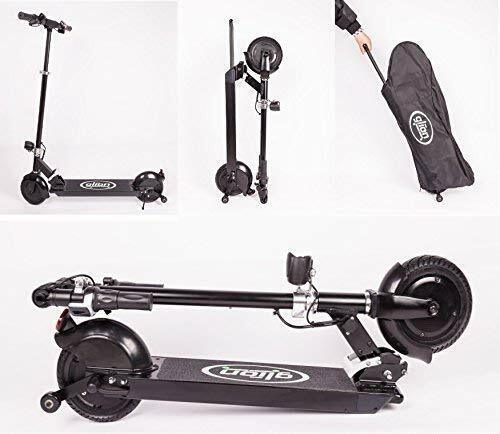 It has been one of the trends which provide the scooter a fast and smooth roll. Root Industries aftermarket parts are phenomenal, they have great bold patterns and color treatments that make their parts stand out in the crowd. The Root Industries is one of the top developer and manufacturer of scooter wheels for many years now. This all new AIR wheels from the Root Industries developed this wheel which is being considered as one of the lightest wheels on the market today. The wheel weighs only 190 grams 220 grams with bearing. This means that you get the strength of the wheels with the lightness of the air of the inner chamber of the wheel. Root Technology is known for developing high quality of scooter wheel which is being patronized by many avid scooter riders. Buying this wheel will give you the assurance that you are getting the premium quality of scooter wheel. Created with Abec 11 bearings, this new AIR wheels will give you the highest quality of riding experience. This wheel is sold in pairs and the bearings are included. Fuzion Ace wheels are for someone who is looking to get a great reliable 120mm wheel. The Ace wheels are 120mm wheels from Fuzion, these wheels feature a custom split spoke design and cores made from 6061 aluminum. From what we’ve been hearing the urethane compound used on the hubs is amazing. Sold individually the Ace wheel allows for you to mix and match creating a true custom look if you choose to. Something else that we love about the Fuzion Ace 120 wheels is that they come with pre-installed ABEC 9 bearings. Available in three different color options the Ace wheel is a little limited in colorways however that doesn’t stop this wheels from making the list. 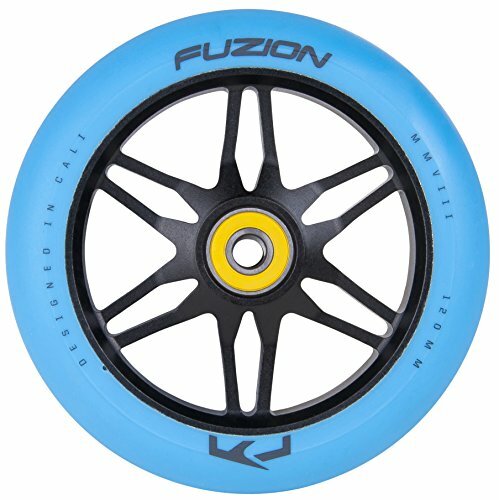 Ultimately Fuzion pro scooters delivers a great aftermarket wheel at a respectable price point. If you like the way they look by all means get a set. The blue hubs with black cores are our favorites. Please check your fork compatibility before upgrading to 120mm wheels. River Wheel co. landed on the scene and made a huge splash with their eye catching colorways. Their collection of Glide wheels are made with specific performance in mind. 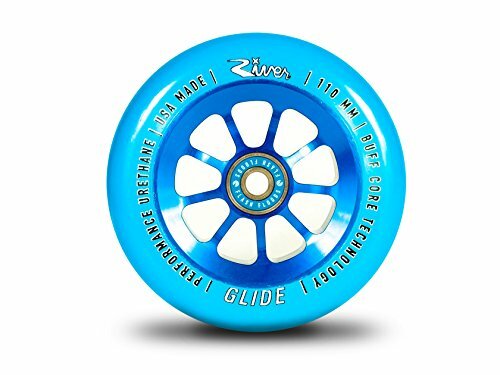 The rider who is looking for grip should opt for the River Glide wheels, unlike the Rapid wheels these have a softer urethane compound allow the wheel to give and grip ground surfaces better. These wheels are sold in pairs so you won’t be able to mix and match unless you know a friend that might want to swap a wheel with you. A bonus design feature is that all River wheels are slotted so the bearings can be removed easily. Sometimes after a lot of hard riding your bearings can get wrecked and when this happens it a nightmare to get the old bearing out. With River wheels that is never a problem. Flash Flood bearings by River Wheel Co are included with the set of wheels. Inspired by the wheels on a Lamborghini Gallardo, the Lambo wheels from Envy are 120mm and have a durometer of 86A. Envy just doing what they do best, riding waves and trends perfectly. What kid or even adult doesn’t want a Lambo? Envy makes the dream attainable on a scooter with their aftermarket Lamborghini wheel. 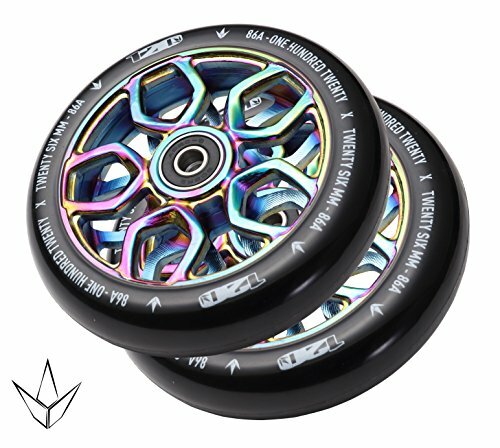 Designed for style and comfort these wheels are sized in 120mm and are available in 3 different colors: Oil Slick, Chrome and Black. One often over looked feature is scooter wheel width. These wheels are 26mm wide over 2mm wider than the standard scooter wheel. With 120mm wheels its important to make sure that your current fork will support the wheel size upgrade. If not you may end up paying for a new compression system, fork along with the new set of wheels! Ride 858 is a relatively unknown scooter brand but they are backed by a nice team of talented and experienced riders. Having experienced riders seems to have been a nice luxury for them as they seem to get it when it comes to parts design. The perfect example are these Signature Jackson Bartlett wheels. 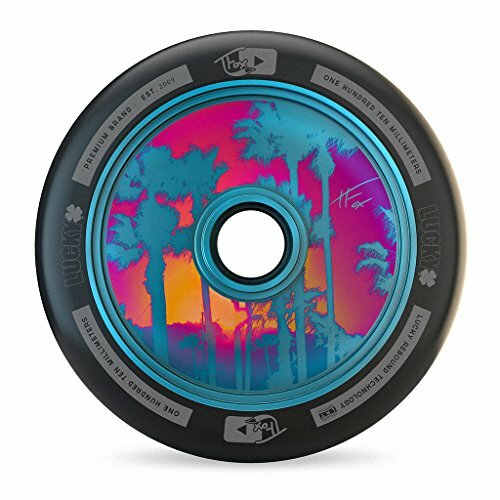 Marketed as the “Simple the best designed by the best” these wheel feature amazing graphics. Jackson Bartlett’s theme is set on the King playing card. Enough looks whats under the hood of these wheels? Similar to the Envy Lambo wheels the Slik Riks have a wider surface area to provide sturdier landings. Urethane compound is another thing that was a focal point as the Ride 858 formula was developed to be extremely resistant to heat, making the wheels last longer. 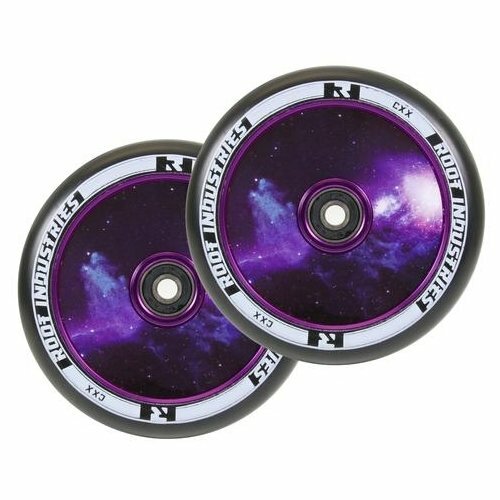 With sick graphics, a simple clean design and performance specs like heat resistant urethane and wider radius these are some of our favorite wheels for 2018. 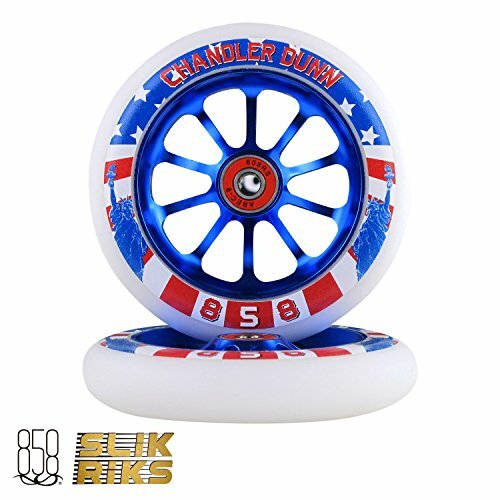 SIMPLY THE BEST DESIGNED BY THE BEST - CHANDLER DUNN has worked with our team to design these one-of-a-kind polyurethane formula wheel, to give you a ride your friends will envy. Wouldn't you love to these on your scooter, designed by a Pro, the way they want them, they way they need them and the way you deserve to have them? In buying for your new scooter wheels, metalcore is better than the plastic core. If you love to skate at the park with the rough course just like the street, for sure you want the wheels to stick better and roll better. The higher the number of the bearings, the tighter the tolerance and it means that you can have better scooter experience if you choose to buy the scooter wheel with the higher number of bearings. The above list of the top pro scooter wheels includes the most recommended scooters. If you want to get the best performance from your scooter, then these wheels are all worth considering. All of the above choices are from noteworthy and reputable brands know for quality. If you see something that speaks to your individual style then go for it. When you are looking to decide on a pair of wheels make sure that they will fit your application. Most complete scooters do not come with forks that support 120mm wheels so double check this before upgrading to 120’s.